With just 50 days until the UK general election the opinions of young people are becoming ever more important to politicians. However research suggests that young people are becoming increasingly disengaged from the political system, with many feeling that politicians are failing to discuss the issues which matter to them. Only 41% of those aged 18 to 25 intend to vote in the 2015 election (British Future, 2015), a 3% drop since 2010. However, numbers fluctuate when taking regional variations into account; 62% of young people in Scotland intend to vote compared with 33% in London, for example. In addition, a recent study by the Scottish Parliament’s Devolution Committee into attitudes to politics among those aged 16 and 17, found 56% would be ‘very likely’ to vote in a UK Parliamentary election given the chance. WISERD Education is currently running a longitudinal Cohort Study in 29 primary and secondary schools across Wales. Led by Professor Sally Power and Professor Chris Taylor, the study asks pupils about their school, home and social life to better understand ‘what it’s like to be a pupil in Wales’. This study aims to give a voice to young people in Wales, particularly on region-specific issues such as the Welsh language and Welsh cultural heritage. Dr Sioned Pearce, one of the study’s researchers based in Cardiff, recently discussed this issue with the BBC Wales’ Steffan Messanger as part of the pre-election coverage on young people and politics and presents the key preliminary findings below. Initial findings show 16 and 17 year old respondent’s view on politics and political issues are mixed and often contradictory. This is interesting given the pre-electorate age group but also given the changing constitutional shape of the United Kingdom (UK). While data on the UK electorate, election forecasts and trends are well publicised, less data is available on the attitudes and political tendencies of those not yet eligible to vote. With this in mind, coupled with decentralisation and constitutional reform as a crucial element in the general election campaign, this research aims to better understand the attitudes to politics among ‘the voters of tomorrow’ in Wales. Devolution increasingly influences the attitudes to politics we see in the UK today, the most recent and clear example being the 2014 Scottish referendum. However, according to territorial rescaling theory the contrast between lived experience and political, social and personal identification with space, means an individual or group living in a territory with delineated boundaries may not necessarily identify with the assigned political characteristics of that space. When applied to this study we can see young peoples’ subjective view, experience and attitude to politics in Wales seem to contrast with the issues UK politicians are talking about at a crucial time in British constitutional history. 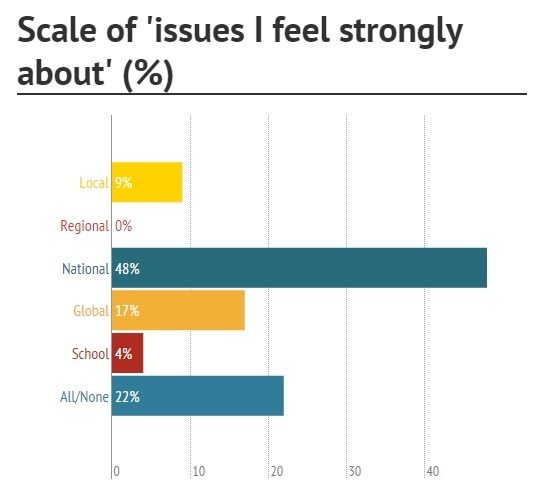 This raises interesting questions about geo-political representation, such as: at what scale are the issues young people care about? And who is representing these issues at which scale? 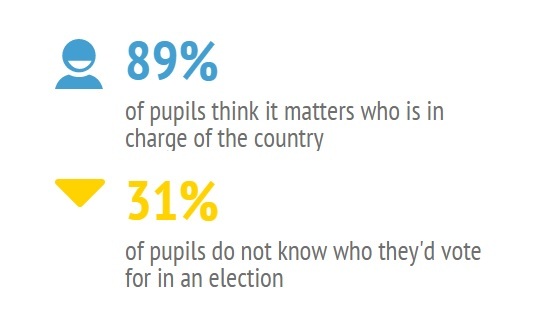 In the run-up to the 2015 general election a team at WISERD Education asked over 500 young people aged from 12 to 17 in 12 Welsh secondary schools for their opinions on politics. We are still collecting data, but have around 400 responses so far with 120 of these coming from 16 and 17 year olds. 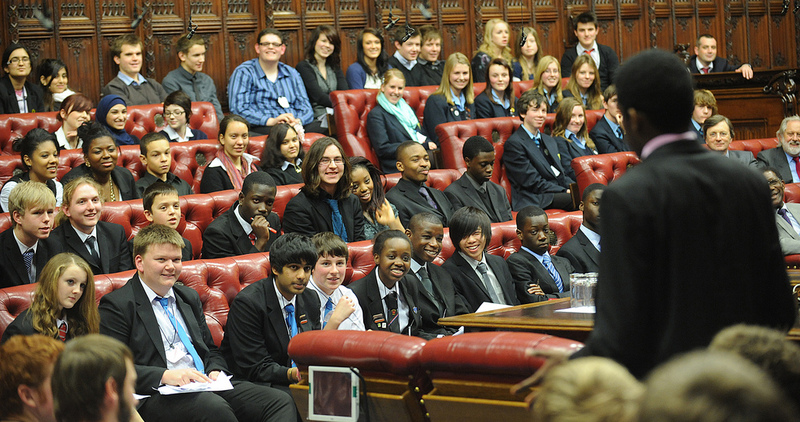 With a general election on the horizon, attitudes to voting age and political parties among this group are of particular interest, especially given recent government discussion around lowering the voting age to 16. In addition, because of the high voter turnout among Scottish 16 and 17 year olds last September (around 80%), the high number of Scottish 18 to 25 year olds intending to vote in May (estimated at 62%) and the approximate number of Scottish 16 and 17 year olds who would vote in a general election given the chance (56%); gauging the ‘Welsh angle’ against the ‘referendum effect’ has become essential. 18% would not vote in an election given the chance. So what do these findings tell us? In terms of ‘who’ runs the country, the 89% who think it is important could be referring to political ‘leaders’ or a ‘political party’. Research shows, despite popular belief, leader ‘personality’ is less important than political party ideology when influencing voters (Aarts, Blais & Schmitt, 2011). With this in mind we looked at attitudes to political parties among our respondents. 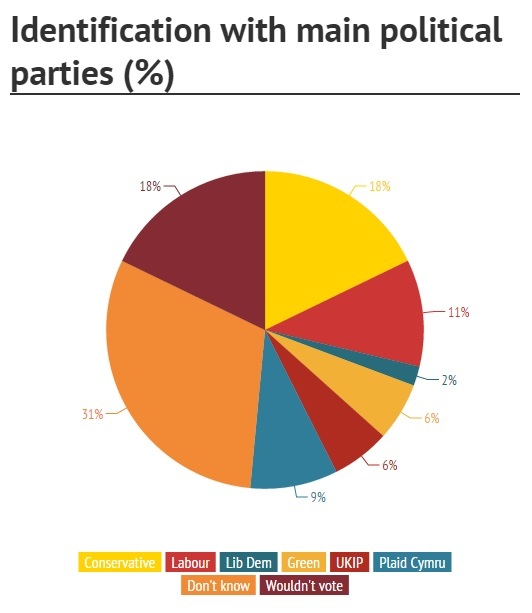 The data reveals a common lack of strong identification with any of the main parties. Our results show the Conservatives with 18% of the vote followed by Labour with 11%,Plaid Cymru with 9%, the Green Party and UKIP with 6%, the Liberal Democrats with 2%. However, most significantly is the 46% who ‘would not vote’ (18%) or ‘do not know’ who to vote for (31%). This shows both an active choice not to engage in the democratic process or perhaps a lack of either knowledge, motivation or the will to engage. This could also explain the number in favour of lowering the voting age to 16 (43%), small compared to other studies of this type. For example, the Youth Citizenship Commission (2009) found 64% of 16 and 17 year olds supported the proposal to lower the voting age to 16. However, to contradict the small number wanting to vote, 70% think politics affects their lives to some degree. Results are divided between 23% who said politics affects their life ‘a lot’ and 47% who said ‘a bit’. 30% said ‘not at all’. This means a significant number feel politics affects them but want no further control over who is elected. Speculatively pupils could be shying away from taking part in selecting ‘who runs the country’ because they see it as a responsibility. Equally the lack of strong favour for any of the political parties could mean the group would like to engage in the democratic process but do not feel they have a representative in the political sphere that would allow them to do so. Do young people feel particularly unrepresented by political parties? This question is especially relevant to the Liberal Democrats; with only 2% of the sample’s vote, could their U-turn on tuition fees have lost them this age group? Findings will be explored further to unpack these ideas. Despite the mixed messages on engagement with democratic processes, 47% felt strongly about a particular issue. 42 issues were given and then coded into 22 categories ranging from ‘agricultural’ (including badger culling and dairy prices) to ‘terrorism’ (including Middle Eastern politics and ISIS) and ‘pressure to attain’ (including school being stressful and support for Russell Brand). The most frequently occurring issue (19%) was equality, generally, but also specifically between genders, races, religions and groups. This was followed by a concern about racism (linked with UKIP in one case). Results depict a well-informed group of young people who care about a number of meaningful, politically-related, issues. This contrasts with attitudes to voting and elections and points to a larger problem of democratic rather than political disengagement. To consolidate this problem the issues raised do not resonate strongly with the most talked-about political issues among politicians according to a recent study. The Keller Fay Group (2015) found the most discussed issues in the run up to May 2015 are: ‘democratic and constitutional reform’, ‘immigration’ and ‘the NHS’, followed by ‘leader values’, ‘party values’, and ‘the EU’. To focus on the issue of devolution and in-line with territorial rescaling studies, the issues have been sub-categorised according to the geographical scale at which they are located, ranging from local to global. The majority of issues (48%) were located at ‘national’ (UK) scale. With devolution in mind, this is particularly interesting. None of the self-reported issues related directly to living in Wales. So while the Scottish referendum served to engage the 16 and 17 year old population on the issue of devolution, the same ‘effect’ is not visible among our sample group in Wales. Indeed the rise in popularity among the SNP has not been mirrored in support for Plaid Cymru, exemplified in the result shown here. However, the cohort study asks a number of direct questions on attitudes relating to living in Wales, such as language, culture and politics, which will be analysed alongside the results presented here and may give a better understanding. We are still collecting data from pupils in schools across Wales so the results may change in the run up to the election. Following 7th May we will be exploring the answers in more depth to understand the nuances and variations in attitudes to politics in Wales among ‘the voters of tomorrow’. Note: The study is now in its third year, and is funded by the Higher Education Funding Council for Wales. About the author: Dr Sioned Pearce is a researcher based at Cardiff University. She is currently working with WISERD Education on a three year quantitative, longitudinal cohort study tracking attitudes, experiences and expressions of primary and secondary school pupils at key stages of their education across Wales.